Radon Testing CT for for FHA Mortgages, VA Mortgages, Conventional Mortgages, FHA Refinances, VA Refinances and Conventional Mortgage Refinances. Radon is a naturally occurring radioactive gas. You cannot see, smell or taste radon. Certain soils may contain high levels of radon because of their uranium content. Radon levels can be found everywhere in the world and high levels have been found in CT. Exposure to radon increases your risk of developing lung cancer. According to the United States Environmental Protection Agency (EPA), radon causes more cancer deaths than any other single pollutant except tobacco smoke. 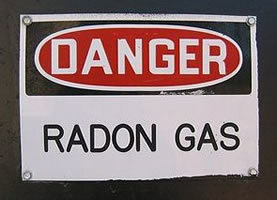 Radon is a gas, and therefore, moves easily through rock and soil into the air. CT outdoors radon levels are low. In an enclosed space like a house radon can increase to high levels. The gas can get into a house through cracks in the foundations and block walls, sump pumps, drains, and other openings in the basement floors and walls. There is no way to accurately predict whether a CT house will have high radon. The only way to know for sure if you have high radon levels is to test for it. Two adjacent homes may have very different radon levels. Radon test results are reported in picocuries per liter (pCi/L) of air, which measures the radioactivity of the air. The Environmental Protection Agency (EPA) has used a guideline of 4 pCi/L as the action level for indoor radon since 1985. If a level of 4 pCi/L or higher is detected, further testing is recommended. Our CT Radon Testing Specialists use continuous monitors to test for radon. Results are available within 48 hours . Click on the link for a list of CT radon mitigation companies that specialize in radon reduction, mitigation and abatement. If the radon level in your home is 4.0 pCi/L or higher they can guide you as to what you should do next. We are happy to answer any questions you may have. Schedule your radon testing today! For an immediate quote call us at 888-558-1574.